Check out Part 4 of the XR toolbox series: Bring your own Container (LXC) App. 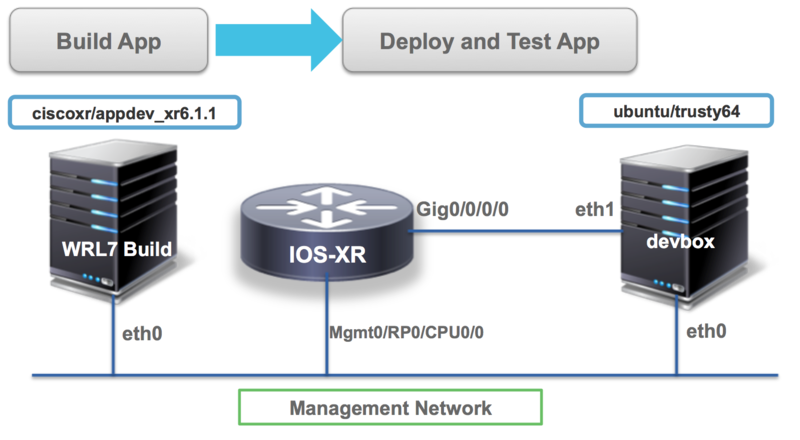 In this part, we explore how a user can build and deploy native WRL7 RPMs that they may host in the same process space as XR. 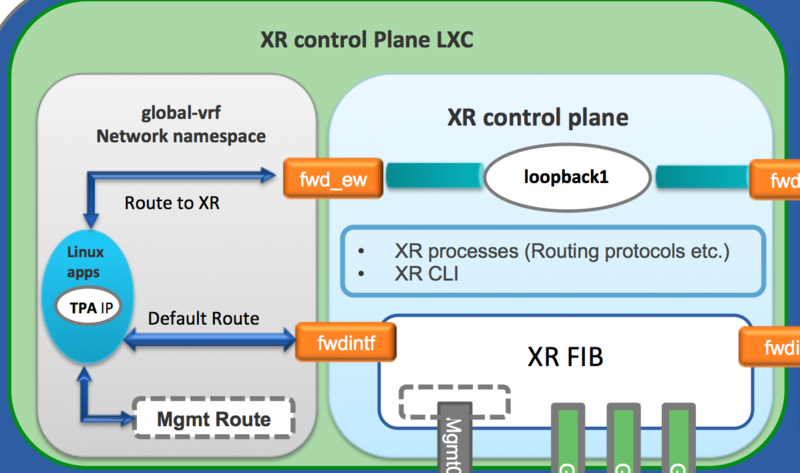 The gray region inside the control plane LXC represents the global-vrf network namespace in the XR linux environment. Today, IOS-XR only supports the mapping of global/default VRF in IOS-XR to the global-vrf network namespace in XR linux. From XR CLI: Issue the bash command to drop into the XR linux shell from the CLI. 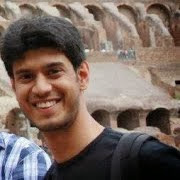 Over SSH using port 57722: Port 22 is used by XR SSH. To enable a user/tool to drop directly into the XR linux shell, we enable SSH over port 57722. Any reachable IP address of XR could be used for this purpose. Any Linux application hosted in this environment shares the process space with XR, and we refer to it as a native application. WRL7 Build: Since IOS-XR uses a streamlined custom WRL7 distribution, we need to make sure we have the latest WRL7 environment available to build “native” apps. For this reason we have released the https://atlas.hashicorp.com/ciscoxr/boxes/appdev-xr6.1.1 vagrant box to match IOS-XR release 6.1.1. You will simply need to reference “ciscoxr/appdev-xr6.1.1” in your Vagrantfile to spin it up. devbox: This is the ubuntu/trusty64 image we have been using in the other tutorials for LXC creation and generic application testing. IOS-XR and devbox instances talk to each other over Gig0/0/0/0 and eth1 interfaces respectively. remote: Counting objects: 204, done. Receiving objects: 100% (204/204), 27.84 KiB | 0 bytes/s, done. We will need a spec file to build the RPM. The spec file we intend to use is shown below. The highlighted sections are important. This file is already available in /home/vagrant of wrl7_build server, thanks to the “file” provisioner that run as part of “vagrant up”. License: Copyright (c) 2015 Cisco Systems Inc. All rights reserved. We can transfer the iperf RPM to the router directly over the management network. The password for user vagrant on the router is “vagrant”. we need to set the src-hint for applications to ensure reachability in routed networks. Yay! iperf server is running natively in IOS-XR. Need to get 0 B/56.3 kB of archives. We’ve successfully built iperf as a WRL7 RPM, installed it natively inside XR and tested iperf operation over XR’s data port (Gig0/0/0/0 connected to devbox eth1).